The story is almost too good to be true. One of the greatest photographers of the 20th century, among the most omnivorous and hyperperceptive visionaries ever to use a camera, was entirely unknown before 2007. That’s when a young Chicagoan named John Maloof went looking for images to illustrate a history of his neighborhood that he was writing and bought a box of unprinted negatives at an auction for $380. It held between 30,000 and 40,000 frames, shot from the 1950s through the 1970s, by a woman named Vivian Maier. The photographs weren’t useful for his project, but a new world opened and a star was born. The odds against this exact buyer’s walking across the street to this auction and stumbling on these photographs, then having the wherewithal and dedication to save and piece together the life story of this extraordinary forgotten woman, borders on the providential. Now, in the absorbing 83-minute documentary Finding Vivian Maier, Maloof and co-director Charlie Siskel peel back her layers, allowing us to see where her creative universe came from, how she functioned, what she made. Much of the film is made up of straightforward interviews with her former employers interspersed with wonderful visuals: Maloof laying out all of Maier’s stuff on the floor or describing his attempts to track her down, and a great array of her amazing pictures. Working as a nanny in the Chicago area, Maier found positions where she could be taken care of so that she could take care of her art. She was a servant of her talent, compelled to use her servitude to make what she needed to make. Many will find her story compelling and filled with pathos. 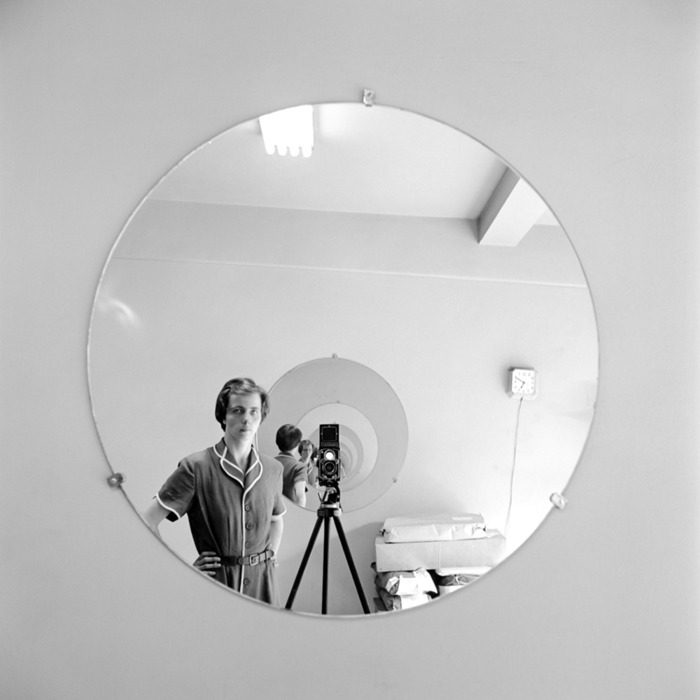 Born in New York in 1926, she started taking photos in 1949, with a Brownie. Three years later she acquired a state-of-the-art Rolleiflex and really started bearing down on her vision, shooting everywhere she went, mainly on the street, but also in stores, at the beach, on ferry boats, in her room, of kids, herself, and never stopped making photographs until her death in 2009. Almost nobody knew. She was a hoarder, filling her rooms with mountains of stuff. Interviewers describe an odd, intimidating, almost Asperger personality, someone who walked rigidly and swung her arms as if marching. She took no guff and would bring the kids she tended anywhere — including, at least once, to a slaughterhouse, where she photographed them. A tall, pretty, but unglamorous woman in neutral and often outdated clothes, she always wore her camera around her neck, even when caring for her charges. She traveled the world alone, taking pictures everywhere she went, and also made audio recordings and shot movie film. In 1976, she switched from black-and-white film to color, more or less permanently. She rarely printed her images, carefully storing them instead. She never exhibited them. Maloof has dedicated himself to reassembling as much of her work as he can, and since he bought that initial lot at auction, he has amassed almost 150,000 negatives, proving that Maier was an astonishingly productive, driven artist. She’s also a great one. Her pictures can stand alongside of and sometimes recall those of Cartier-Bresson, Lisette Model, Robert Frank, André Kertesz, Diane Arbus, Richard Avedon, Walker Evans, Gary Winogrand, Richard Avedon, and Weegee. Maier’s world is simultaneously monumental and humdrum. She sometimes seems to lie in wait for subjects, catching them as they get off buses, come up subway steps, walk out of shops. She gets people in mid-stride but makes them somehow classical in stature, not fleeting, but whole, self-evident, mortal. Bells go off when you look at her pictures; you become witness to something big. Proust talked of “the apogee of the particular.” That’s here. This gives Maier’s work psychological and philosophical force, something deeply observant. At the same time, she also has an outsider’s view of the world. She’s one who watches, silently observes, is alert to the tiniest disturbance in the visual or psychic field. She gives us a vendor nodding off in his newsstand, framed by magazines and newspapers, giving the dream to a sleeper. The valor of being alive comes into focus. The Times’ otherwise excellent Manohla Dargis churlishly labeled this documentary “a feature-length advertisement for Mr. Maloof’s commercial venture as the principal owner of her work.” This sort of cynical snappishness is cropping up a lot in many critics’ work of late — the idea that if there’s any profit involved, the work must be less pure, less good, more suspect. Whatever: I love this advertisement. Besides: Maloof tried to get MoMA interested in Maier’s work. In the film, he shows us and reads the perfunctory rejection letter he got from the museum. He was on his own. No one else wanted to take on the responsibility of unearthing and bringing to light this truly great artist. History will be grateful to him, and no one should look back cynically at his commitment to Vivian Maier.